When my first son was old enough to have solids, he started like any other kid. He had an interest in food but didn’t care much if he was eating the same thing as me or something totally different. Then around the time he was 8 or 9 months old, he started to notice whenever I was eating something that he wasn’t. This presented a problem for me when it came to baked goods. We had decided not to give him any refined sugar until he was much older, but baked goods are always choked full of added sugar. So I started experimenting with refined sugar free baking and it turns out that you really can have baked goods without all of the added sugar. 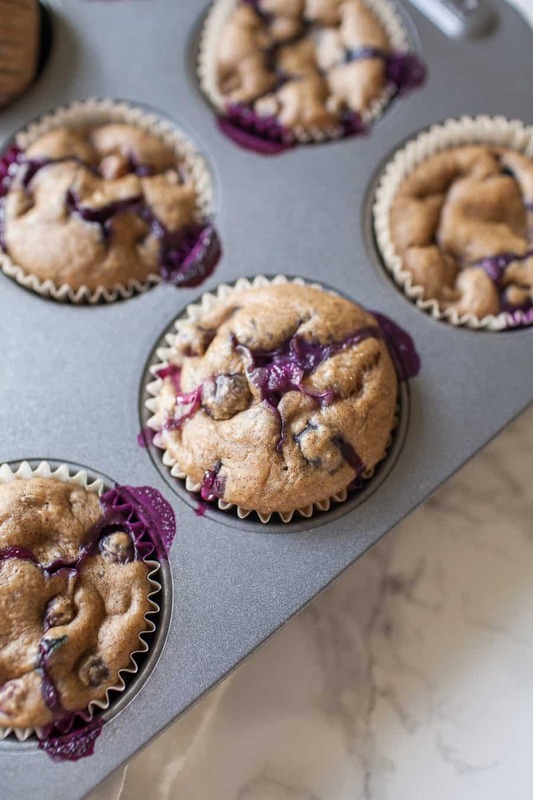 These Healthy No Sugar Added Blueberry Muffins were the first recipe I made without added sugar and as someone who’s grown up on store bought, sugar filled muffins, I was skeptical. But these muffins are so good and you don’t even notice there isn’t added sugar in them! How do you make muffins without sugar? There are a few ways to bake without sugar. You can use applesauce, honey, maple syrup, or dates to sweeten baked goods without sugar, using naturally found sweeteners. 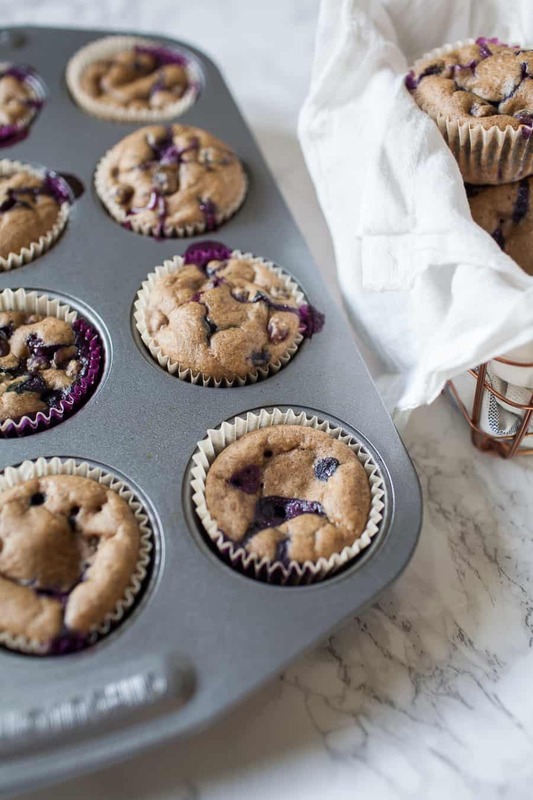 These healthy blueberry muffins are sweetened with dates, by blending chopped dates with boiling water to create almost a paste consistency. I love that these no sugar added blueberry muffins are perfect for toddlers. 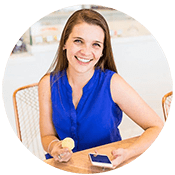 I’ve made these handfuls of times for play dates or just an after nap snack. These muffins are a treat that the whole family can shamelessly indulge in! My husband actually took them to work and only told people that they were refined sugar free after they commented about how good they were. No refined sugar, simply sweetened with dates. Oats are one of the most nutrient dense foods you can eat! Fresh blueberries add sweetness and also tons of health benefits. 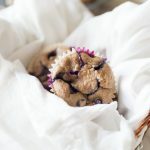 Another one of my favorite healthy blueberry muffin recipes is this Blueberry Oatmeal Muffin recipe made with coconut sugar! How do you make muffins in a blender? 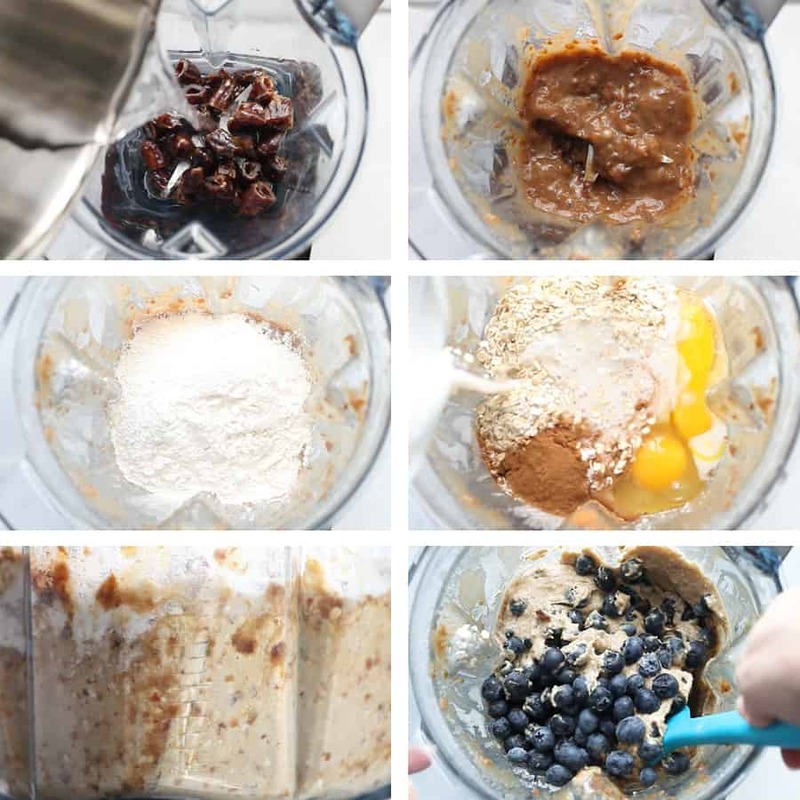 Making muffins in a blender is almost as easy and pouring all of the ingredients into the blender and turning it on! You’ll want to put the solid ingredients like flour, baking powder and spices on the bottom and pour the liquid on top. Add in fresh fruit after blending the batter completely by folding fruit into the batter. What can you use instead of a blender for these muffins? 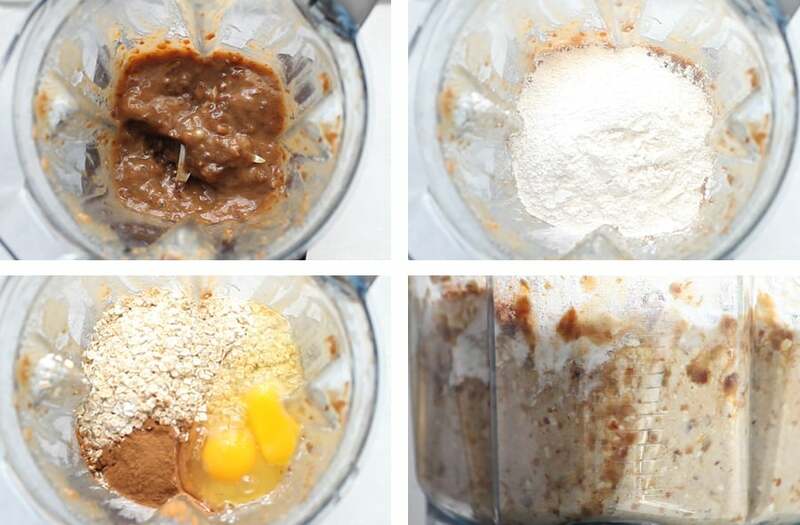 If you don’t have a blender, you can use a food processor instead! You really do need one of these two things to be able to puree up the dates. 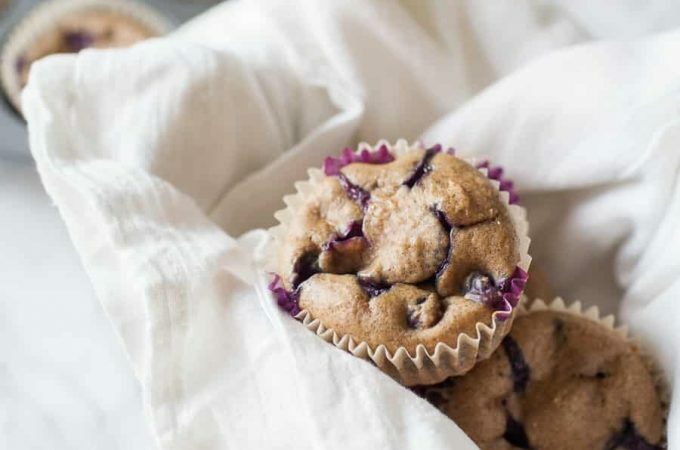 If you don’t have either, you can try this Healthy Lemon Blueberry Muffin recipe instead, which is still refined sugar free, but sweetened with coconut sugar instead of dates. 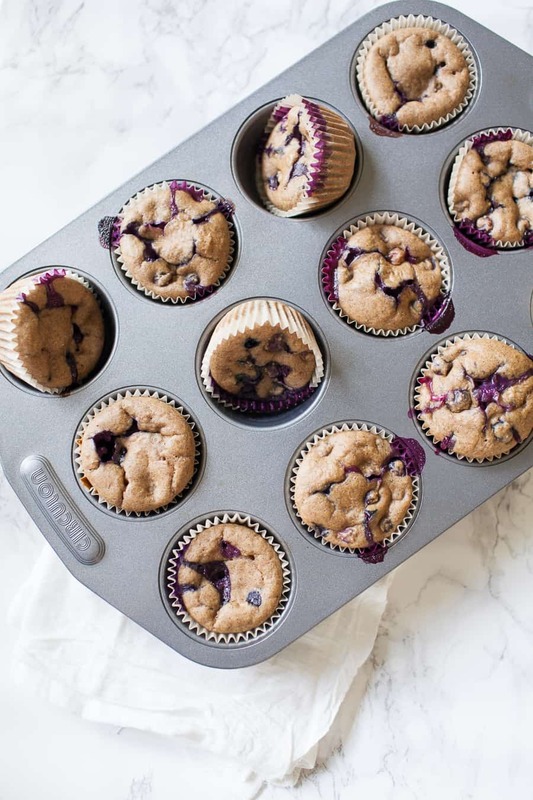 What kind of flour do you need for Healthy Blueberry Muffins? You can pretty safely alternate between any kind of flour for this recipe: all purpose, whole wheat flour, bread flour, pastry flour, even a 1-1 gluten free flour. You can also do all oats instead of oats and flour, if you prefer. Each one may have a little different texture, but won’t affect the overall quality of the muffins. What kind of milk should you use for Healthy Blueberry Muffins? You can use any kind of milk, whole milk or 2% milk or a nut milk like unsweetened almond milk. I like to use unsweetened almond milk because I often make these for toddler play dates and have some friends who are dairy free. Can you use frozen blueberries in blueberry muffins? Yes, you can use frozen blueberries in place of fresh blueberries in a blueberry recipe. Do not thaw the frozen blueberries. Chop dates and add them to your blender. I like to use kitchen sheers to cut pitted dates in half and throw them right into the blender. Add 1/2 cup of boiling water to the dates and blend until smooth. There will be small pieces of the dates in the mixture, that’s okay. Add the rest of the remaining ingredients, starting with the flour, oats, baking powder, baking soda, salt and cinnamon. Then add the liquids, vanilla extract, eggs, and almond milk. Pour in fresh blueberries and fold into the batter with a flexible silicone spatula. 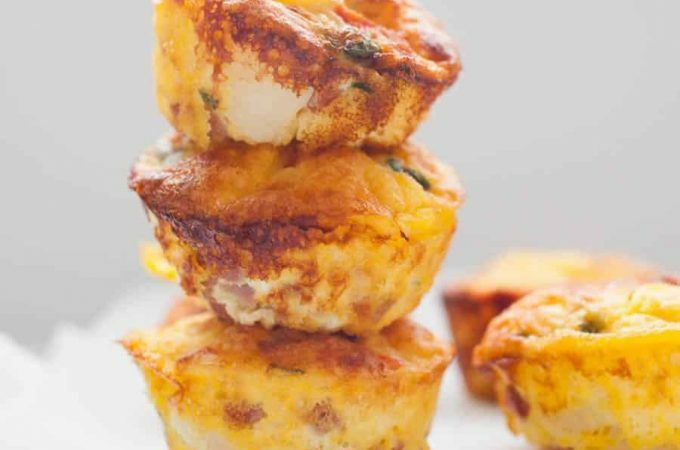 Bake in a muffin tin for 18-22 minutes, until muffins are nicely browned and bounce back when gently touched. Choose an “entree” for a brunch, like an egg casserole or Bacon Roasted Broccolini Gruyere Quiche. 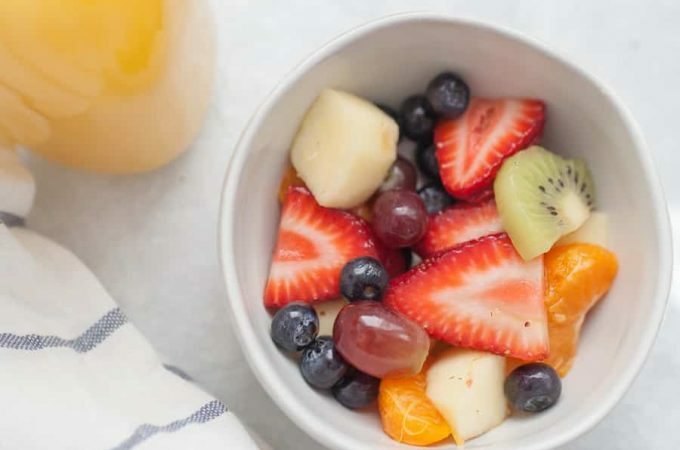 Choose a few side dishes, like Orange Juice Fresh Fruit Salad or Bacon Roasted Potatoes. 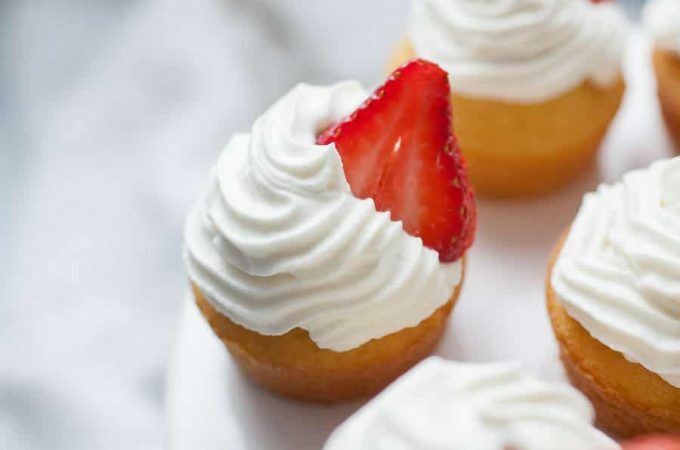 Choose some brunch mocktails and cocktails to bring it all together, like Strawberry Ginger Punch or Irish Whipped Cream Coffee. Make a batch for a new mama- she’ll thank you for the quick snack! I’d recommend sticking to non-dairy milk in this case, as a lot of breastfeeding moms avoid dairy for the first few months. 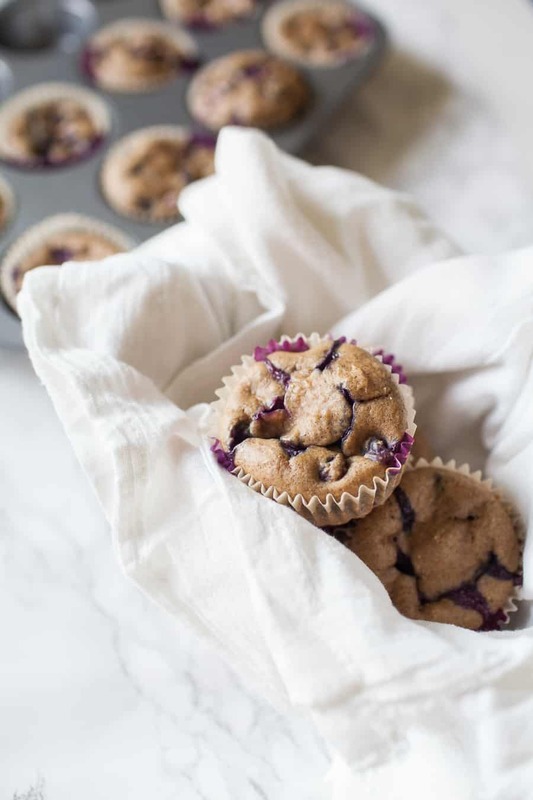 Take these toddler friendly no sugar added blueberry muffins to a play date. Plan a park or zoo play date with a friend and bring these muffins to share. Pin this recipe to make it later! Oh girl! How stunning are these. I’ve really been meaning to get better about making healthy breakfasts for myself and these are simply stunning. I need a batch in my life pronto! Half the reason I wanted to share the recipe is because they looked SO pretty! Thanks girl! I love muffins like this – I have a version I’m sharing in the next week or two sweetened with just a banana. I bake them as mini muffins and stock the freezer and my toddler loves them! Those sound delicious! I’ll have to track down the recipe from you! Oh yum! Girl, these muffins sound easy and downright delicious! You could totally just use regular flour if he isn’t allergic! I love this and make it all the time but can you substitute the flour for a more low carb option? I love using the dates for a sweetener. Hi Jessica! I’m SO glad to hear that you love the muffins. I’m not too familiar with low carb options for flour. Let me know if you find anything that works well! Love the idea of using dates for sweetness, great tip! Thanks Jolene! It’s been a game changer for my muffin recipes! These look absolutely fabulous. I love the ease of muffins but not the sugar, so I am going to have to give them a try! These sound just about perfect to me, and I love that they’re healthier! Thanks Colleen! I hope you enjoy them. I love that there is no extra sugar in this recipe – going to add it to my muffin rotation for the kiddos! I love using dates in baking, they’re both tasty and a great alternative to refined sugar. These look great! Yes! I need to experiment with them in things other than muffins sometime too! This is awesome! I’m always looking for ways to work healthy treats into my menu! These are the best healthy muffins I’ve ever tasted! I love that they don’t use sugar. I feel so much better about feeding them to my kids! Thanks for the recipe! These look so good and I love that they’re made in the blender! I actually have a giant Costco-sized container of dates in the pantry that I need to use. These will be perfect! It’s nice to get away from white sugars in baking. 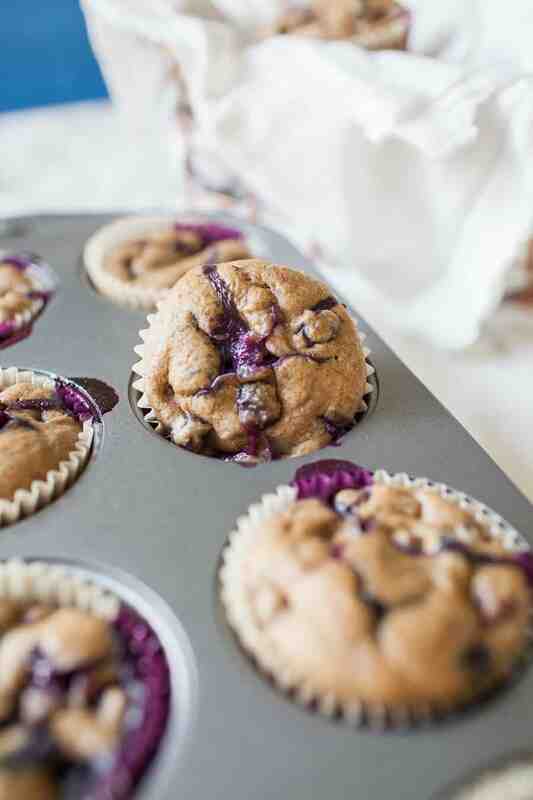 We love blueberry muffins and are always up for trying new recipes. These look wonderful. I like having a muffin with coffee but really need to get away from all the sugar. Can these muffins be made in a food processor instead of a blender? Yes, they can! You can also just mix by hand after you puree the dates and water, if you’d like 🙂 Thanks for the question!